Yellowglen were at the forefront of the resurgence in Victorian viticulture decades ago, they have since continued to set the style of sparkling wine for discerning palates across Australia. Synonymous with fashion, festivity and the relaxed enjoyment of life, Yellowglen are shared at every social occasion, by people with a taste for flavoursome, stylish and approachable sparkling wines. It begins with the quality of fruit and skill in winemaking, because a job well done has its own rewards, as the girls who make Yellowglen, love to drink it too. Australia's most popular brand of sparkling wine was established in 1971, as a hobby by Ballarat businessman Ian Home. He partnered with specialist Dominique Landragin, born and bred in Champagne. 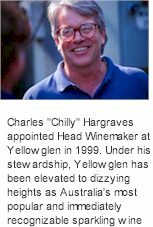 Two years later, the classic yellow labelled Yellowglen was released to rave reviews. Yellowglen can truly rely on making their wine from the best fruit, they retain the finest vineyards and most dedicated viticultural team. Every aspect of Yellowglen's flow of operations, from the planting of vines to vinification and presentation, is designed to deliver a satisfying experience to discerning palates. An assemblage of Chardonnay and Pinot Noir, Yellowglen is treated to a mix of new and old world winemaking techniques. Light straw hue, a fine persistent bead. Lively nose of strawberries and custard apple, supported by stonefruit characters and a citrus lift. Lovely mouthfeel and creamy mousse, a generous palate, filled with fruit, lifted melon flavours, pineapple and citrus notes, peaches and cream, before a wonderfully refreshing crisp, dry finish. The first choice in an aperitif wine, Yellow mates well to luncheony dishes and Al Fresco faire.